The jazz world is filled with good pianists; some play in trio settings, others work unaccompanied and many work with large ensembles. Frank Kimbrough does all that and more - he also teaches. Over the past year, he's kept his regular gigs teaching at the Juilliard School and performing with composer Mara Schneider (both in her wonderful Orchestra and in a small ensemble plus strings backing soprano Dawn Upshaw as she has been touring a new work she commissioned Ms. Schneider to compose.) This spring, he toured Indonesia with bassist Ron Carter and just finished the premier concerts of the undiscovered works of composer/arranger Gil Evans that Ryan Truesdell has been working on for the past 16 months. O yes, he's done duo concerts with saxophonist Noah Preminger as well as the occasional gig with vocalist Maryanne deProphetis. This Thursday (May 31), Frank Kimbrough (pictured above) ventures to North Branford, CT, where he will walk into Shoreline Piano, 50 Shaw Road. Once there, he will sit down at a piano (preferably a Steinway) and play. This is the final concert in the venue's "Live at the Piano Shop", a concert series that began in January of this year in association with Jazzhaven.org. Click on the link to find out more information and purchase tickets. And why should you go? Mr. Kimbrough, one of the nicest people on the face of the planet, is also one of the more fascinating solo pianists you're likely to encounter. There were a number of years he played plenty of solo piano gigs in and around New York City and built up a huge repertoire (Monk, Ellington, Herbie Nichols and others.) Nowadays, when he does a solo show, he does not lay out music or create a set list - he sits and plays whatever comes into his mind. This time around, you may hear some of that Gil Evans material or the tunes he played with Ron Carter. Frank Kimbrough will and can play whatever his muse chooses. It's a one-of-a kind concert by one fine person. To fnd out more about him and his many musical associations, go to home.earthlink.net/~fkimbrough/. Several years ago, Ms. Miller assembled a group featuring bassist Todd Sickafoose and pianist Myra Melford; they recorded a dandy CD for the Foxhaven Records label (violinist Jenny Scheinman appears on 1 track) using the monicker of Boom Tic Boom. The group's new release, a vinyl only 2-Lp set "Live at Willisau", features saxophonist Marty Ehrlich and pianist Dan Tepfer along with Ms. Miller and Sickafoose. For the New Haven gig, Ms. Melford returns to the ensemble along with bassist Brad Jones and saxophonist Donny McCaslin. The pianist, recent winner of the 2012 Alpert Award in the Arts for Music, last performed at The Firehouse on April 6 of this year with Trio M. If this music excites you, go to firehouse12.com or call 203-785-0458 for tickets - they'll go quickly. To find out more about Allison Miller and get a good taste of her music, go to www.allisonmiller.com. His latest CD, "The Creep" (Plastic Sax Records), is his first on his own label and also the first without a pianist. With an excellent rhythm section including the fine young drummer Ulysses Owens, Jr., and rock-solid bassist Paul Sikivie, Nash (who sticks to alto saxophone although he is quite proficient on tenor sax, flute and clarinet) and trumpeter Ron Horton dance their way through 9 blues-inflected pieces. The comparison to and influence of Ornette Coleman is unavoidable; the lineup, the insistent rhythmic drive on the majority of the tracks, the reference to "plastic sax" in several of the tunes (Ornette played a plastic alto saxophone in the 1950s and early 60s) and in the "open-ended" feel of the music. Yet, none of these musicians are clones and Nash is an intelligent composer. The real difference from his other projects/recordings is how "loose" and "easy" these performances feel. The New Orleans feel of the saxophone-trumpet lines that serve as the "theme" of "Twilight Sounds" (composed by fellow alto player Sherman Irby), Sikivie's bluesy strut that leads the title track in, the high-energy romp of "Plastic Sax Rumble" followed by the soothing harmonies "Plastic Sax Lullaby", all these add up to a joyous listening experience. Nash and Horton blend their voices with such ease; neither feels the urge to play too much, with solos that "speak volumes" in a few bars. Owens, who has been working with Kurt Elling and Wynton Marsalis as well as Christian McBride and Nicholas Payton, has a major role in this music. Listen to his "conversation" with Nash on "Cabin Fever" (over Sikivie's mesmerizing pedal-point), his exquisite "ride-cymbal" on "Plastic Sax Rumble", the forceful way he drives the quartet all throughout "Kaleidoscope" (an Ornette Coleman tune from 1960's "This Is Our Music") and impeccable fills on "Minor Adjustments" - like Rudy Royston, he's quickly becoming a "go to" musician. Like Owens, bassist Sikivie is suddenly ubiquitous, working with Matt Wilson's Christmas-Trio and Quartet plus gigs with pianist Aaron Diehl and others. He plays with fire and intelligence, never trying to fit lots of notes into his pulsating phrases. He's got the "chops" (certainly evident on "Kaleidoscope" and the sprightly walking lines on "Twilight Sounds") yet he's most important as the foundation of the music. Ted Nash, as well as Ron Horton, are both musicians with impeccable taste, sounding like noone else in the jazz world. They listen, lead, react, are creative with their choices and never rely on cliches. They thrive in this "open" situation, interacting with the rhythm section as if they'd been playing together for years. 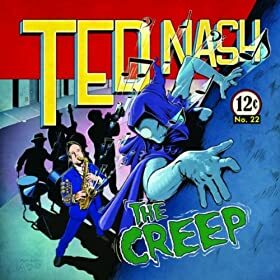 "The Creep" has great comic book artwork from Jonathan Ashley and liner notes from Ivette Dumeng, a singer who worked with Nash on the movie "Chaography: Variations on the Theme of Freedom" - check that out here. Much of this music has its roots in Nash's experiences in his role in the film. If that's what it took to get Nash rolling in this new (for him) direction, so be it. Jazz has been called called the "sound of surprise" but can also be the "sound of joy." This music has what it takes - swing, great rhythms, strong solos, fine melodies - to make you smile and dance. Life does not get better than this. Go to www.tednash.com/blog.html and read what Benny Golson has to say about this music - high praise from a master! Then, go through and read other entries. Ted Nash does an eloquent job of describing the life of a musician.